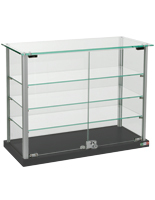 Need a smaller trophy cases for presenting valuable merchandise or other items? 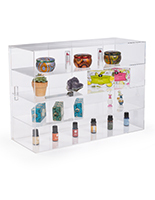 These countertop showcases are great for school awards, figurines and other curios, or they can be used at store fixtures. Cabinets like these are an ideal choice for showing small curios while saving floor space. This type of countertop showcase is available in many sizes and designs with options like locks, lighting or a full view frame. 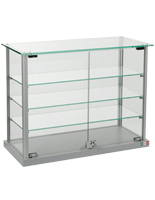 However, all commercial jewelry displays feature shelves and doors made of clear acrylic or tempered glass, materials that are known for their strength. Countertop showcases, or tabletop cases, can also feature strong materials like medium-density fiberboard and wood that allows them to last for years. 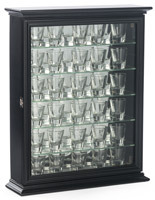 What differentiates between the numerous types of small tabletop cases available? 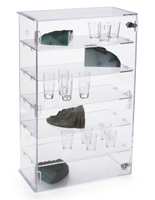 These countertop showcases come in a variety of dimensions to accommodate any merchandise, collectible or treasured keepsake. Containers for desktops are offered with square, rectangular and even octagonal frames. Some countertop stand come with a lock that offers security from tampering or theft, while non-locking showcases offer easy accessibility while still protecting collectibles from dust and damage. Framing and base styles differ from model to model. Silver, black and wood finish edging are the most common colors used. 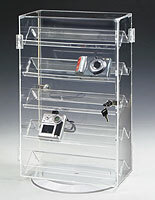 Many tabletop cases feature a frame entirely made of clear acrylic or glass that will easily blend into any interior. What is the difference between these two materials? 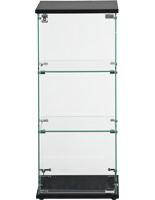 Tempered glass is a highly durable material that creates full visibility when viewed directly. On its sides, it has a sleek blue-green color that adds some style to any setup. Clear acrylic panels offer a similar look at a lower price point. While not as strong, showcases with an plastic construction can feature a full view design that gives maximum visibility, including from the top and bottom. What are some of the many uses of these tabletop cases? Countertop stands with a lock are a great choice for high-ticket electronics or other expensive items, because they offer 360° visibility of the objects while limiting physical access to the objects themselves. 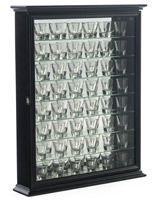 These store fixtures are ideal as jewelry displays or cabinets for fashion accessories. 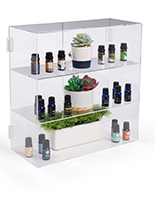 Specialty retail shops, such as those selling model trains, toy cars or similar collectibles can use these full view containers to both highlight and protect their merchandise. Other curios that are great for these store fixtures include mini helmets, antique watches and dolls. Signed sporting goods such as footballs or baseballs can be displayed without fear of damage in larger models. 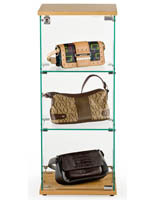 These retail jewelry displays are often found in galleries showcasing individual items for show, sale or both. 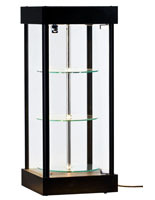 Hand-blown glass pieces can be safely located in the middle of a high-traffic area without worry about damage or theft when a secure cabinet is used. Many schools savor creating panoramas of awards and trophies won by students and teams through the years. Collectible demonstration covers that lock are an excellent choice for custom memorabilia collections such as these. 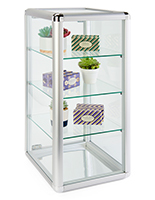 Whether it's a collection of thousands of diecast train models, a roomful of mini helmets, a shelf of modern collectible action figures, or a single Nascar® memento, an acrylic container will both protect and share these treasures. 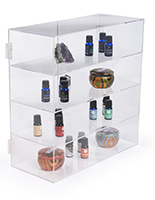 Businesses, retail establishments, museums, galleries, even libraries, hotels, and individual collectors will appreciate the convenience of these enclosures because they can safely feature a wide variety of items. 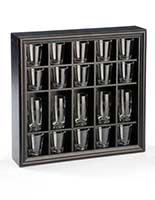 Order before 2PM EST for same day shipping on DisplayCabinets2go.com!